As the sunlight created a collage of graphic prints on my wall, I woke up to a rather familiar smell of Sunday morning. The hypnotising smell of “kalojeere” nigella/onion seeds dancing in bubbling mustard oil before green chillies are added. Such pleasures of familiarity are some of the perks I enjoy staying in the Bengali neighbourhood of Delhi. Such familiarity also deeply saddens me to prepare my rather mundane breakfast of toasts and tea. As I pull myself out of the bed I imagine cubed potatoes being fried with a dash of salt and turmeric and finally water being poured in. By the time I prepare myself a cup of Darjeeling tea and browse through “Robibashoriyo” ( Online edition) the final nail on the coffin is here i.e., the smell of the luchi ( disc shaped flour based flat bread) being fried in Lakshmi Ghee. I recognise the distinct smell from my Mashi’s household (Maternal Aunt) preference for Lakshmi Ghee and my mother’s preference for oil (supposedly healthy!) which led to many a world war in the kitchen. The overpowering smell of luchi and alur tarkari lingers on and takes me back to some funny moments from childhood. My mother was known for preparing white fluffy luchis and was coveted by G an M for “sada luchi” as if luchis could be red, yellow, or blue. Once, B now a handsome young man then 5 years old made this brilliant comment in a roomful of strangers, “I think they are preparing luchis upstairs. Ma, let’s go and have some luchis”. To save further embarrassment his mother got B upstairs and he walks in straight up to my mother and says “Jethin, amake luchi aar chini debe”( Jethin (aunt, elder brother’s wife), please give me luchi and sugar). For all luchi fanatics, the last luchi should be savoured with sugar. And yours truly embarrassed the Oh! Calcutta waiters by asking for a bowlful of sugar to be savoured with luchis… Such luchi anecdotes are precious and the overpowering smell of late riser’s breakfast menu continues to increase my craving for luchi as I pen down this post. It’s 11 a.m. The smell of luchi will soon encounter the Sunday staple of “mangshor jhol”. Puritans like my dad, uncle and jethu will tell you that mangsho or meat refers to kachi pantha ( mutton). The ideal kochi panthar jhol will have potatoes that will carry the flavour of mutton and the cracked edges from the “jhol” or gravy. Jhol is our answer to “curry”- a runny gravy with rightly flavoured spices. The pressure cooker whistles will soon create the symphony of a Bengali Sunday lunch and a mirage of cravings for people who need to finish boring dishes like dalia khichdi that has been lying the fridge. Such distractions of smell will never find an acknowledgement in my thesis but they are part of the woes and joys of writing. Another whistle goes… and I can smell the perfect whiff of paanchphoron crackling… May be time to prepare “green mango chutney” (aam chutney) or “paanch mishali sabji”(mix vegetables). I leave you to guess as to what dish my neighbours are cooking with paanchphoron in oil. Do write in and let me know of whiffs from your neighbourhood that leaves an imprint in your food rituals? Who does not enjoy a lazy lunch at a cosy café with a lovely company to lift your spirits? Taking a break from blogging to concentrate on finishing chapters, and draft has hit a standstill. Self-confinement, not buying myself a new dress to celebrate New Year has proved to be futile. None of these not to do lists include anything related to eating out. It is that time of the year in the capital when you cannot think of venturing out in the afternoon. So if you wake up to a cloudy day, and if you are a fan of the song “Ei meghla dine ekla ghare thakenato mon” (song from Film : Shesh Porjonto) you might want to get dressed and venture out to Café Lota. Café Lota has been the talk of the town ever since it opened up in the National Crafts Museum, Delhi in Pragati Maidan. As you walk down the passage you will spot this wonderful outdoor café, neatly tucked away from the hustle bustle of the city- a perfect dining retreat. Hang on! 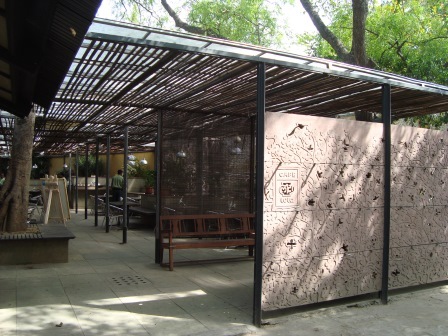 For all of us who love outdoors and are thinking of the summer heat; the café’s bamboo slatted roof is neatly arranged for the right amount of light and perfect canopy to beat the heat. The seating arrangement is nice, cosy and unlike other outdoor café/s there is enough room and space between tables. Simple and cosily done up interiors compliment the menu which arrives in clipboards- the boards I associate with my drawing classes. 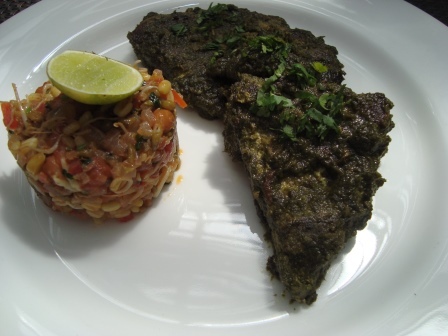 The menu has something to offer from some of the states across India and not too overpriced. We skipped the “smaller plates” and settled for two non-vegetarian items from “larger plates”. The café is no overpriced. The smaller plates ( vegetarian and non-vegetarian ) has nine options ( with six vegetarian items) and three non-vegetarian items. What is interesting is the pricing! All the items under vegetarian and non-vegetarian items are priced the same across smaller plates and larger plates. The larger plates has ample choices starting from sarson da saag ( mustard leaf preparation from Punjab) , to the staple kadhi (yoghurt and gramflour based gravy from Sindh) to Kerala veg stew and even the wonderful khichdi from Gujarat and the non-vegetarian larger plates brings to us a taste from Konkan, Goa, Kerala and Parsi food. The non-vegetarian dishes come for Rs 375 each and we settled for Goan Galinha Cafreal and Parsi Salli Boti. The Goan Galinha Cafreal looked exactly what I expected from its description on the menu card. I enjoyed the crisp spinach pao with dollops of coriander chutney that came an accompaniment. The chilly coriander rub on the soft chicken pieces complimented the perfectly done sprout salad. My friend ordered Parsi Salli Boti. Before I go on to describing the mutton based dish something must be said about the parathas. They were flaky and the ajwain seeds and coriander gave it a nice bite. A perfect accompaniment to the soft succulent mutton pieces that melted in your mouth. We polished off the meal with sips from Nimbu Pani. Refreshing with a hint of mint was the perfect cooler on a hot day. 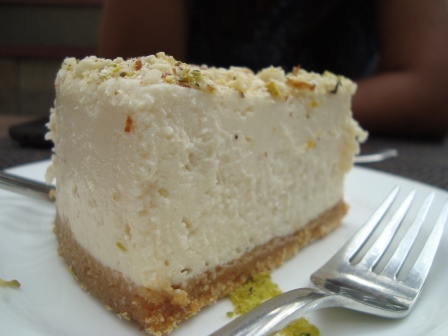 Finally, the Bhapa Doi Cheesecake (Rs 125) – an interesting twist with Bengal’s bhapa doi (steamed curd) and cheese… Must try ! After our lazy meal, C and I took a stroll around the Crafts Musuem . As I prepare my checklist for the next visit I would recommend Café Lota to all those who want to sample menu from some of the Indian states. I wish the owners are able to incorporate some more regional items which do not feature right now. The place offers balanced vegetarian and non-vegetarian items from some of the states across India and is a welcome break in terms of an outdoor dining experience in the heart of Delhi. For all those who want to sample regional specialties within India, make a stopover here before you explore the wonderful craft museum. 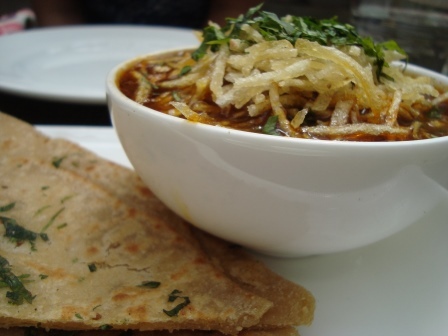 Plan a day at the craft museum with a lazy lunch break at Cafe Lota. And for all those romantic souls it is the perfect place to unwind as well for a silent cosy lunch or dinner. To lazy lunches and cloudy days ! Address: National Crafts Museum, Pragati Maidan, New Delhi.